You want your business to stand out, and Office 365 can help you make an excellent impression. You can easily create and update an attention-grabbing website to market your business, and attach your custom domain name to your email address to increase name recognition. And meeting your customers and partners online with HD video conferencing and screen sharing will show them how professional are. Get started using your services fast. Deploy with step-by-step guidance and set up users quickly. Access your admin center from anywhere to easily manage all your services, from email accounts to file-sharing rules. With a 99.9% uptime guarantee and robust recovery-oriented design, you can work free of interruptions and delays. 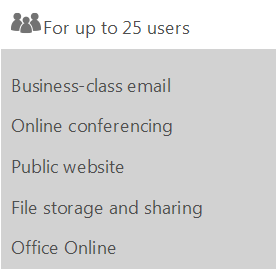 1Office 365 Small Business is compatible with desktop versions of the latest version of Office, Office 2010, Office 2007 (with slightly limited functionality), Office 2011 for Mac, and Office 2008 for Mac.